Writers of flash fiction sometimes seem to be cult-like in their devotion to the form. Though short fictions have been around for as long as fiction has been written, flash fiction as a distinct genre is fairly recent, dating to around the 1980’s, when the very title of the category was still in dispute (in some corners it still is) – sudden fiction, lightning fiction, quick fiction, etc. (at The Potomac – http://thepotomacjournal.com — we call this category of stories under about 1,000 words “quictions”). Thus, there is a certain novelty associated with flash fiction, and writers of flash often appear to feel a need to justify and explain what they are up to, almost as if representing a cause. Anthologies, panel discussions, college courses have proliferated in support of the mission – and it does feel like a “mission,” all right! As the various names suggest, the best of these stories are not just brief but are more like “revelations” or “epiphanies” – of scene, character, situation, relationship, etc. The more blah, ordinary flashes are usually nothing but jokes and anecdotes without much insight, but even the less successful suggest how electric the form could be if properly executed. 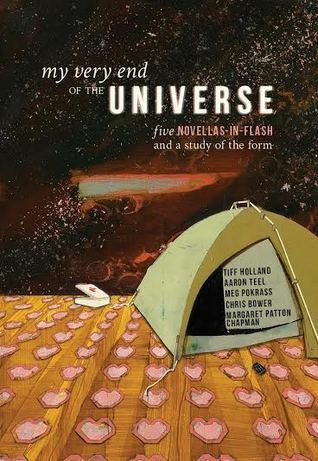 My Very End of the Universe is a collection of five novellas written in flash segments – stories, chapters. Since flash fictions can pretty much be characterized by an absence of plot – stories are not so much developed as they are “displayed,” like a narrative painting – yoking these two forms presents intriguing challenges and possibilities. The flashes must be organized in such a way as to develop a larger narrative, flesh out character, usually to suggest a temporal span. Indeed, in addition to a thorough and engaging introduction by Rose Metal Press editors Abigail Beckel and Kathleen Rooney, each of the five authors – Tiff Holland, Meg Pokrass, Aaron Teel, Margaret Patton Chapman and Chris Bower – preface their flash novellas with reflections on their craft in general and how their particular novellas took shape, specifically, often citing influences along with critical decisions they needed to make along the way. These introductions themselves are worth reading for this light they shine on the craft of writing. Often, intriguingly, the authors compare the creation of their novellas to other creative forms, such as sculpture (Holland) or quilting (Pokrass), cartography (Chapman) and Polaroid photography (Teel), insofar as overlapping Polaroids mimic overlapping memories. Bower says he always starts with poetry. My Very End of the Universe is thus as much a guideline to working with the form as it is a showcase of the form in practice. In fact, Rose Metal Press has published several volumes in this vein – The Rose Metal Press Field Guide series (guides to writing flash fiction, flash non-fiction, prose poetry…) with tips from editors, writers, teachers. So, My Very End of the Universe is as much about instruction as it is about entertainment. But entertaining these novellas are. All five share certain thematic traits. All of them involve families, mothers and daughters (Betty Superman, Here, Where We Live, Bell and Bargain) or brothers (Shampoo Horns, The Family Dogs). The stories are like flashlight beams thrown for an instant – a flash! – on some incident that illuminates a character; strung together we see that character develop in time: overlapping Polaroids indeed. Four of the novellas are related in the first person by the child, the daughter or the son, in the family context, and the one that isn’t – Bell and Bargain – still focuses primarily on the young girl. With some qualifications it can therefore be said that each novella-in-flash in My Very End of the Universe is a sort of bildungsroman showing the education, formation, coming-of-age of one of the principal characters, even if the real focus – as in Betty Superman, which centers on the mother in the title – is elsewhere. The unnamed speaker, Betty’s daughter, tells stories of her youth, dating, marriages, her mother’s impact throughout; she now has a daughter of her own. At the end, though she has health problems of her own, she is taking care of her mother who suffers from emphysema. Betty’s impact is felt throughout, why her daughter is who she is. In Pokrass’ novella, the family – mother and daughter — has moved to California from Pittsburgh, where the teenaged speaker Abby’s father was killed in an accident. It’s a novella about the awkwardness of being a teenager (the self-consciousness of men ogling her new breasts is symbolic; breasts are symbolic in this novella). As in many of these novellas, there are health issues in Here, Where We Live. Her mother has breast cancer, but also her mother’s new boyfriend Daniel is a louse, and Abby’s best friend is not much of a friend at all, and her best friend’s older brother Kyle? Well, you decide. We do not necessarily get a sense of conclusion in these novellas. As Pokrass ends her own novella-in-flash – “This feels like a scene in a movie that comes somewhere right near the middle, when the popcorn tastes just right.” – we may only get a glimpse of where things are so far, and why. Indeed, Shampoo Horns ends in a flash of fireworks that simply illuminates Cherry and his brother Clay, how they got to where they are on that Independence Day in Texas. Bell and Bargain has an almost fairy tale feel to it, the way the character Bell is developed – speaking her own name at birth, for instance – but by the end, when her mother dies (Bell must be about Abby’s age in Here, Where We Live), she, too, must now make her way in the world, and we don’t really have a sense of how that will be. How can we? When I was small Mom used to hold me in her palm, cupping me with her fingers. She didn’t have unusually large hands, I was just unusually small. “Yes he is,” Mom said. “Can you wear him out to dinner?” he asked. Again we’re confronted with a family unit — mom-and-dad-and-kids – seen in glimpses and flashes. All of these similarities give My Very End of the Universe a certain cohesive feel; one assumes this overall pattern led the editors to select these five novellas to fit together as the very patchwork quilt, to use Pokrass’ metaphor, that the flashes themselves make of each novella. This is a volume that devotees of flash fiction will want to own and that all readers will enjoy. So – go ahead, drink the Kool-Aid.